And the Rotterdam refineries are also doing quite well in the longer term: since 2005 they have reduced their CO2 emissions by as much as 20% (2.1 million tonnes), while production in the same period increased by 4%. On top of which, the facilities are making far more low-sulphur products - a relatively energy-intensive category. The NEA figures cover all companies that fall under the emissions trading scheme. 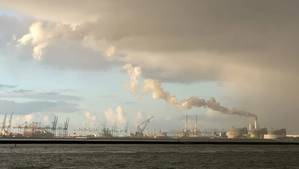 This amounts to 96% of all emissions released by Rotterdam's industrial sector.